OXFORD, Ohio – Miami has played in plenty of one-goal games in previous months, but there was little doubt about Saturday’s outcome after the first period. Minnesota-Duluth scored four unanswered goals en route to beating the RedHawks, 5-2 in the series finale at Cady Arena as Miami ended the weekend with just two of a possible six critical points. 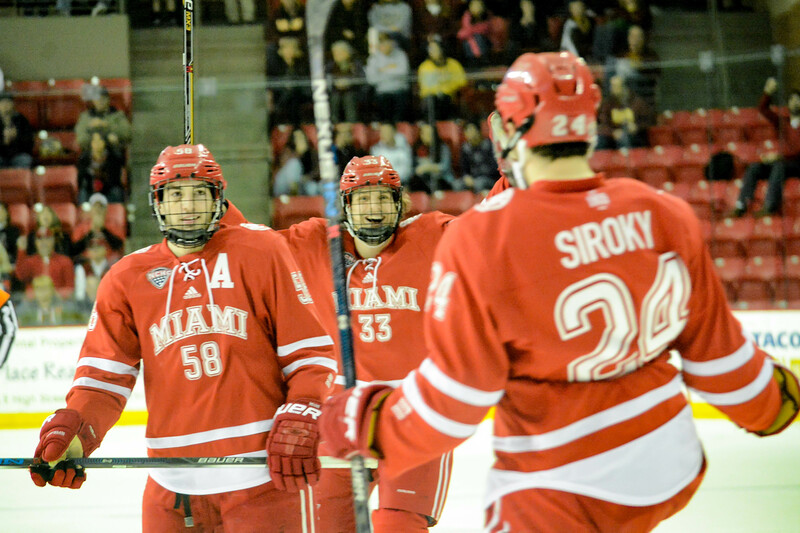 Miami has now won only one of its last 10 games (1-7-2), remaining in seventh place in the NCHC. But the team in now just one point ahead of last-place Colorado College. With 6:08 left in the first period, Neal Pionk put the Bulldogs ahead on a shot from the high slot that pinballed off several bodies before ricocheting into the net. Less than three minutes later, RedHawks senior goalie Ryan McKay made a highlight-reel save on a point-blank shot by Austin Farley, but the rebound came to Tony Cameranesi, who fired the puck over a sprawled-out McKay from the slot, making it 2-0. UMD (8-7-4) extended its lead the three when Dominic Toninato whipped a shot into the side of the cage off a drop pass from Blake Young seven minutes into the middle stanza. Just 2:04 after that goal, McKay attempted a stretch pass from the side boards, but it was intercepted by Parker MacKay, who fired it into the empty net, ending McKay’s night. Miami (6-11-3) did attempt a comeback, started by sophomore defenseman Louie Belpedio ripped a low shot that beat Bulldogs goalie Kasimir Koskisuo to make it 4-1 with 3:24 left in the second period. RedHawks freshman Ryan Siroky spun and fired one top shelf for his first career goal to cut the deficit to two with 9:39 left in regulation. Ryan Siroky (24) and Louie Belpedio (58) both scored on Saturday (photo by Cathy Lachmann). Although Miami senior goalie Jay Williams did not allow a goal in relief, an empty netter from the neutral zone sealed the win for the Bulldogs with 2:50 to play. The RedHawks managed just six total shots in the final 40 minutes, with two of them finding net. Miami plays a single non-conference game against Bowling Green next weekend, with the puck drop scheduled for 7:05 p.m. at Cady Arena. Posted on January 10, 2016, in 2015-16, University of Minnesota-Duluth and tagged Louie Belpedio, Minnesota-Duluth Bulldogs, Ryan Siroky. Bookmark the permalink. Leave a comment.